Heat a frying pan over medium to high heat and turn your oven grill on high. Meanwhile dice the onion. Put mince and onion in a frying pan and cook until mince has browned. While the mince is cooking grate the carrot. When the mince has cooked drain any excess fat from the pan. Mince the garlic straight into the frying pan and stir in the garlic. Next add the passata sauce, baby spinach and carrot and stir until the spinach has wilted. Break the lasagne sheets into small pieces and add them to the frying pan. Stir through the lasagne sheets until they are covered by the sauce, put a lid on the frying pan (or cover with foil) and reduce to medium heat then simmer for 10 minutes. Stir halfway through cooking. If the mixture seems dry add 1/2 cup of water. While the lasagne is simmering, slice the buffalo mozzarella into thin slices. After 10 minutes, remove the lid from the frying pan and stir through the shredded mozzarella cheese until it melts. 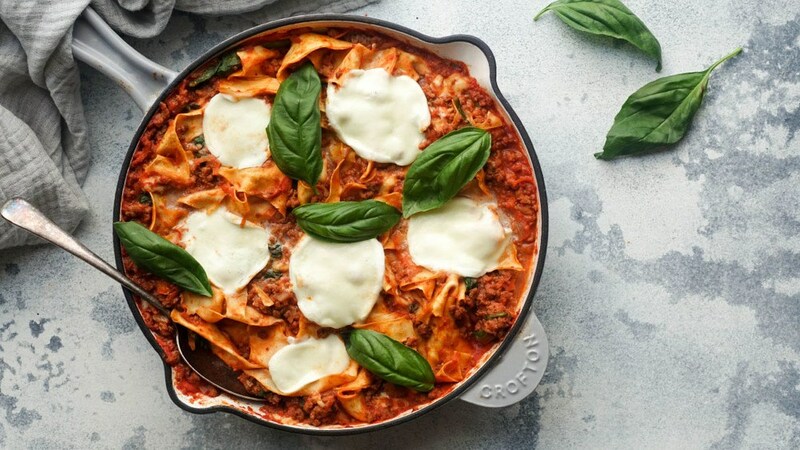 Remove the frying pan from heat, scatter the lasagne with buffalo mozzarella, then put the pan under the grill of your oven for 5 minutes, or until the cheese has melted. Scatter with fresh basil, and serve with mixed leaves.